The Configuration Framework groups all the functionalities involved in the consultation and management of the numerous parameters. Those parameters are not only core parameters (Users, Security Rights, Accessibility, Roles,…) but also business parameters playing a role in the CoCPit modules. 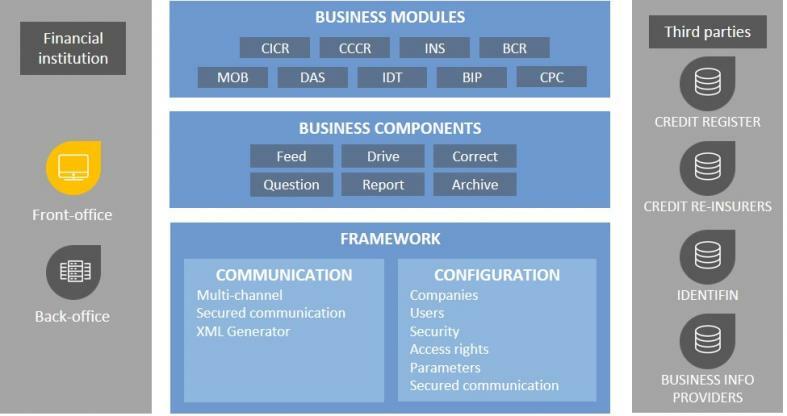 The Communication Framework groups all the software components involved in the communication between the financial institutions and the third-party systems. CoCPit has a multi-channel enterprise messaging system at its disposal and communicates to the third-parties according to their technical requirements. This can be done a.o. through XML generated and S/MIME encrypted messages. The multi-channel feature allows CoCPit to be connected to many back-office or front-office systems. The Business Components have been designed as separate entities that can easily be recombined in any CoCPit module, depending of the client’s objectives. This is the flexibility of CoCPit.